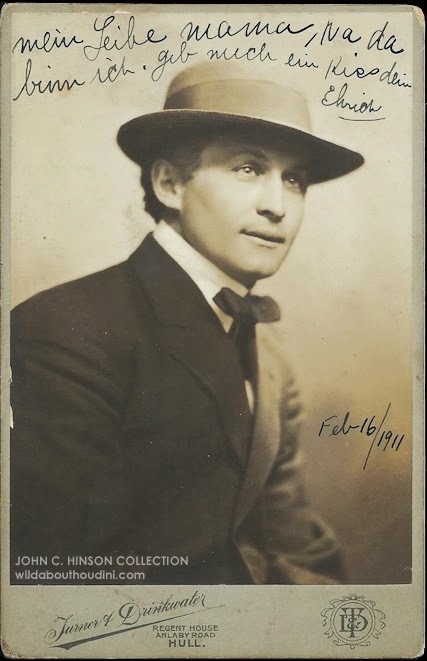 This is WILD ABOUT HARRY's 2000th post, and for the occasion I thought I'd tackle what might be the #1 most common mistake people make when writing about Houdini -- his real name. Or to be more precise, the spelling of his real name. Houdini's real name was Ehrich Weiss. Note the spelling: E-H-R-I-C-H. There's an "H" in there. That is how he spelled his real name throughout his life. We know this because with have numerous examples of his Ehrich Weiss signature. It appears on the postcard he sent his mother when he ran away from home. It appears on love letters to Bess. It appears in signed books and photos. It appears on some contracts and legal papers. Ehrich Weiss. Show me an example of his name spelled any other way in his own hand and I will eat my straitjacket. His name was never Eric or Erich. These are the most frequent misspellings that find their way into print. "Eric" might come from accounts of him billing himself as "Eric The Great" as a boy. (Although I think this might have been a misspelling by early journalists who only heard the name and assumed the most obvious spelling.) But even if this spelling is rooted in a stage name, it's just as wrong as saying Bess's maiden name was Raymond (which also happens). There's no excuse for ever using Erich. It's just wrong, wrong, wrong. However, it certainly looks more correct than Ehrich, so it's understandable how this misspelling can stick in the head and flow off the hand. Even the 1960 biography Houdini: Master of Magic misuses Erich throughout. But there is no justifiable reason for ever using it. So… Erich. The only exception is the spelling Erik Weisz. Now, I don't like seeing this anymore than Eric or Erich, but this is the spelling that appears on his actual birth certificate. However, Houdini himself never spelled his name this way. When the Weiss family came to the U.S. when Houdini was 4, the spelling became Ehrich Weiss and remained so for the rest of his life. This Erik spelling shouldn't be used at all, in my opinion. It just muddies the waters. But the main source of lazy journalists, Wikipedia, lists Erik Weisz as his "real" name, so it is frequently written as such (and I'm afraid I'm responsible for introducing the birth certificate to Wikipedia -- wish I hadn't now). Using a combination spelling his new world first name with old world last name -- Ehrich Weisz -- is a new phenomena that only belongs in fiction. And while it's said his first name evolved from Ehrich to "Erie" to "Harry" (and some boyhood friends remember him as "Harry"), I've never seen Harry Weiss on any documentation, so one has to be careful with that one. So with this 2000th post, let's all get firmly behind Ehrich Weiss. It's the spelling Houdini used. It's the spelling Bess used. It's the spelling everyone used. It was Houdini's real name. Photo from the collection of John C. Hinson. Signature image from a 1901 legal paper reproduced in The Original Houdini Scrapbook by Walter B. Gibson. I feel for Houdini on this - his moniker's seemingly superfluous 'h's remind me of the seemingly superfluous (and confusing) assemblage of vowels and consonants in my own full first name [seen above this post, in brackets]. Most people try to delete the final 'h', or switch the 'i' and the second 'e', or delete a bunch of letters to make "Bethia", the more commonly spelled version of very uncommon name - but which is nevertheless still *not* my name. Anyway, congrats on the 2000th post - may the word spread far and wide! Is that really the spelling of your full name? It's great. Biblical! I'm wondering how Erik became Ehrich. Is Ehrich any kind of a proper spelling. German maybe? Or was it just the jumble of letters the immigration officer came up with. "Bethia - A version of the biblical name Bithiah (Bitya) (1 Chronicles 4:18) that was somewhat common in the 17th-19th Centuries. It was most used in Scotland, where it often served as an Anglicized version of Gaelic names like Beathag." "North German: from a Germanized form of the Old Norse personal name Eiríkr (see Erickson). The spelling of the first syllable has been influenced by German names beginning with Ehr- such as Ehrhardt." You know, it could open a can of worms, but it could be that it was always spelled Ehrich and the birth certificate spelling was just a Hungarian doctor using a more familiar spelling. The Weisses were German speakers first and foremost. They could have actually been correcting the spelling in America. My father middle name Ehrich name after him. To further clarify the Weisz/Weiss issue: German has a letter, ß, called "ess-tsett". It is a ligature of 's' and 'z', and it is pronounced like the 's' in "snake". Even though the letter has its origin in a blending of 's' and 'z', the ß is functionally equivalent to "ss". Indeed, the German Spelling Reform of 1996 recommended dispensing with the ess-tsett entirely and using "ss" instead. So the upshot is that the spelling on the birth certificate, "Weisz" is equivalent to "Weiß" (in exactly the same way as "Caesar" is equivalent to "Cæsar"), and "Weiß" in turn is fully equivalent to "Weiss"! Very interesting. Thank you, David. Could you please tell me what is the right pronounce of Houdini's real first name? Do you pronounce CH like a K in key or like a H as in hay? I admit I don't know. We have no recording or record of how it was pronounced at the time. Most tend to just pronounce it as "Eric." I wonder if HH's parents pronounced the CH like an H as in hay. It would explain the phonetic transition to "Harry."